I added a fan extension card so I could govern my radiator fans separately from the pump... but it seems aida does not sense the fans... it actually sees the heat sensor connected to it... but not the fans? Plans for adding support? Cheers for any info you can provide. Also right-click on the bottom status bar of AIDA64 main window --> Sensor Debug --> SMBus Dump (Full). Copy-paste the full results into this topic, or attach the results as a TXT file to your post. Finally, right-click on the bottom status bar of AIDA64 main window --> Sensor Debug --> Embedded Controller Dump. Copy-paste the full results into this topic, or attach the results as a TXT file to your post. Please also describe how many fans do you have connected, which ones are visible by AIDA64 right now, and the approx. RPM of the missing fans. I have 3 chassis fans attached to the mb and the apogee pump is also attached to the mb, these are sensed by aida... the missing fans are the two radiator fans and one more chassis fan attached to the extension card... they all idle at about 1000 rpm... the strange thing is the thermistor sensors on the same card are sensed... although aida does report 2 more temp sensors and they show 200 degrees C each... i read somewhere else in your forum that this may be caused by aisuite... although i have tried without with the same results. and voila there they are... u da man! i did the same dumps... attached... and my desktop showing all the fans. I meant to mention... in the OSD sensor list... they appear as Fan # 21, Fan # 22 and Fan # 23. Best software development I have ever run into!! You're right, it looks a bit odd. We'll rename those to Fan #1, Fan #2 and Fan #3 respectively, in the next AIDA64 beta update. and this is what your hard work allowed me to do with my 12 inch tablet and arx... cheerz once again! Hi, I have the same extension card but connected to an Asus Z170 pro gaming mainboard and had already given up hope, until I found this topic. Can you do the same for this board also? Is it okay that I reply here or should this be a new topic? Aida64 reads all 5 fans directly connected to the mainboard fine, only missing the two fans connected to the Asus Fan Extension Card. Both missing fans should report between 300 and 800 rpm. Thermal sensors are not connected to the extension card. have u tried the newest beta? yes, installed it right away when I saw this thread, the dumps I added to the post are on the current beta. my sensors look quite different from yours in those logs though. Would I have to have AI Suite installed in order for this beta to read data from ATKEX? 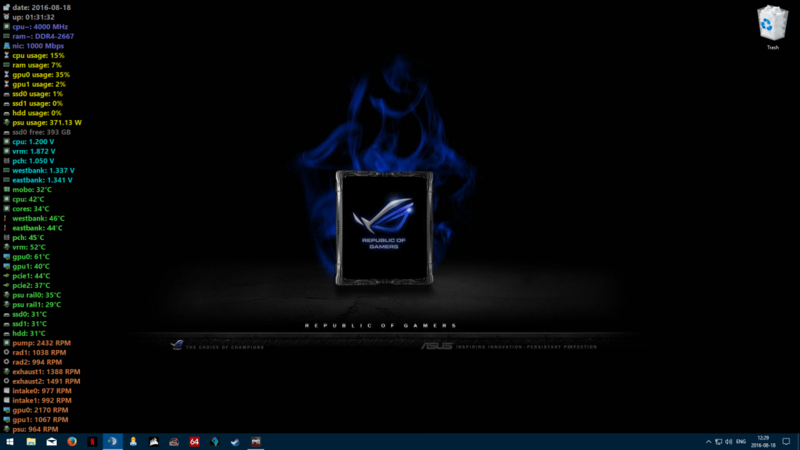 And it even works without having any of the broken asus software installed. 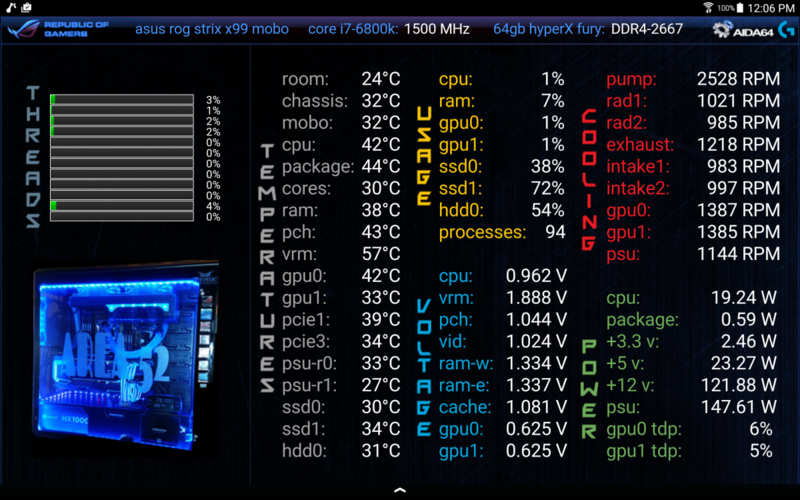 Can you guys confirm whether Aida64 now supports the Asus Fan Extension Card on all Z170 mobos? I have the Asus Z170-A, and I just bought the extension card, I’m waiting for it to get here next week or so. I’m planning to connect 3 fans and 3 temp sensors to it. I just want to make sure that my Aida64 is ready for it Thanks! That's great news – thank you! Unfortunately my new temp sensors are still in the mail and will likely take a while to get here, but I'll test it as soon as I can. Great software, and great support! Welcome, I have a problem with detecting my Fan Extension Card, I see the speed of fans in AI SUITE 3 but I can't configure lcd panel in AIDA, I am a new user of this software please help.